JT had more gift certificates that were expiring so I helped her use them up at Nectar Wine Bar in the Marina. I rarely venture over into that part of the city, partly because it’s not convenient to get to but mostly because it’s the Marina. What is it about the Marina that I dislike? It’s got beautiful views, is picturesque… and there are so many great restaurants and cool shops. There’s just something about the neighborhood which seems elitist and uptight to me. So I wasn’t expecting such a friendly and unpretentious atmosphere at a wine bar in the Marina of all places! Our server was super cool and we greatly enjoyed several very happy hours exploring the exciting menu. 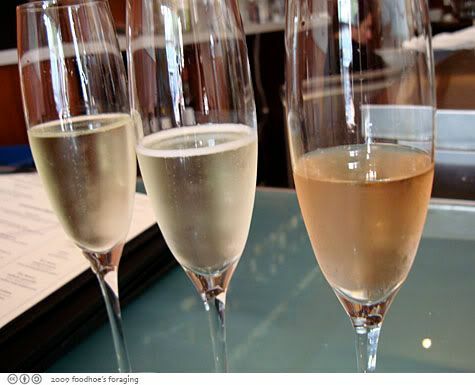 Happy hour is from 5-6:30 and features 50% off wines by the glass as well as on the wine flights. 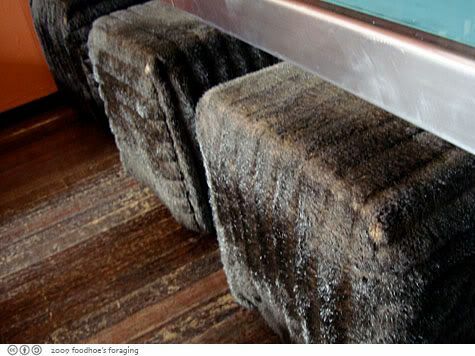 As soon as I walked in, my eyes were drawn to the faux fur cubes lined up along the end of the bar. They were cozy and soon the bartender/server came around with menus and informed me of the happy hour pricing. 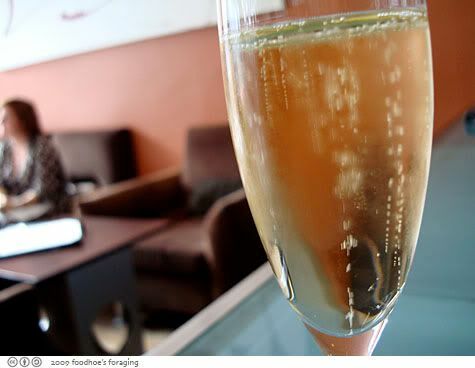 He enthusiastically recommended a glass of Taittinger champagne, which was a steal at the happy hour rate, so at least for the first round everyone in the bar was sipping bubbly. a toast to JT, expiring gift certificates and to good times! 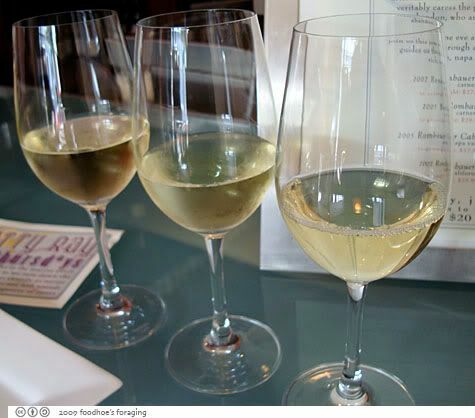 I had the Anything but Chardonnay flight, described as three palate expanding whites for the chard disillusioned… Now, I don’t know about you, but these seemed to be very generous pours. A big surprise for me was the food. I didn’t expect such a variety of well prepared hot dishes, but as it turns out, the chef is a graduate of the Culinary Institute of America in NY and worked with Michael Mina at the now closed restaurant Aqua in Dana Point as well as his restaurant at the Westin St. Francis, as Chef de Cuisine. 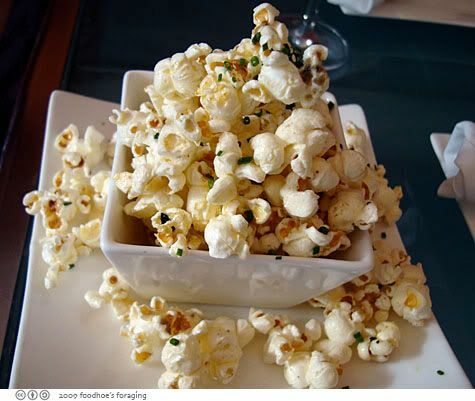 I had to try the Black Truffle Popcorn topped with fresh chives ($6). 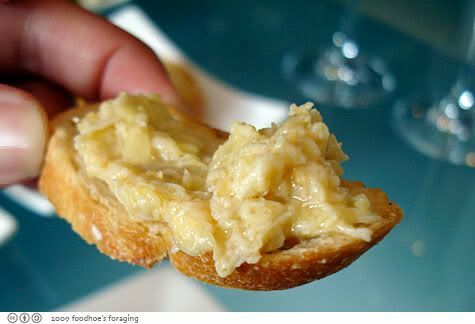 This was buttery and each bite was infused with the earthy aroma from black truffles. 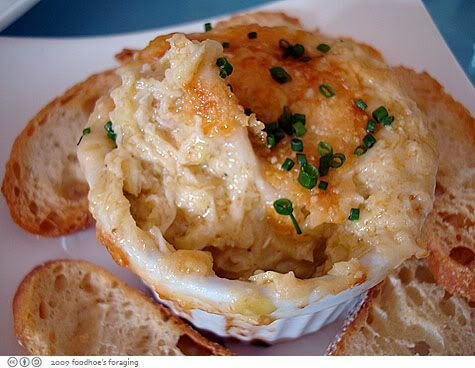 Dungeness Crab and Artichoke Gratin ($12) this was cheesy and very satisfying on the crispy slices of toasted baguette. 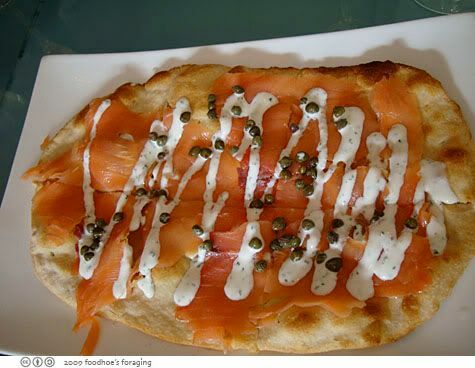 Smoked Salmon Flatbread sans shaved red onions (per JT’s request), with capers and lemon-chive creme fraiche ($13). This was so good we ordered another. 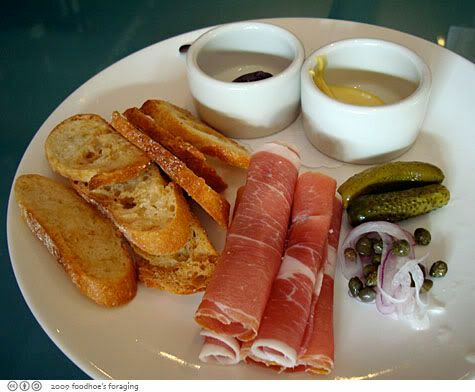 Parma Ham salumi plate ($6) with more of the toasted bread, tiny gherkins, capers and thin slices of red onion, two little bowls – one with dijon mustard and the other with a purple condiment made of grape must. 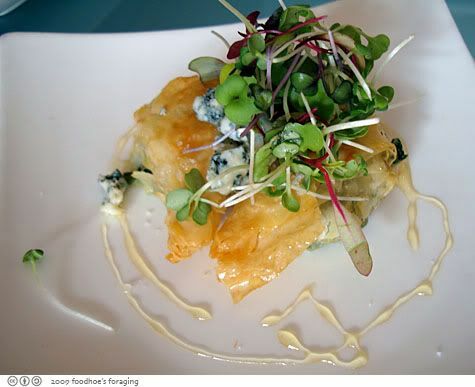 Crispy Phyllo with roaring 40’s blue cheese ($6), served with wilted spinach and drizzled with truffle honey. This was a delicious combination of tastes and textures. 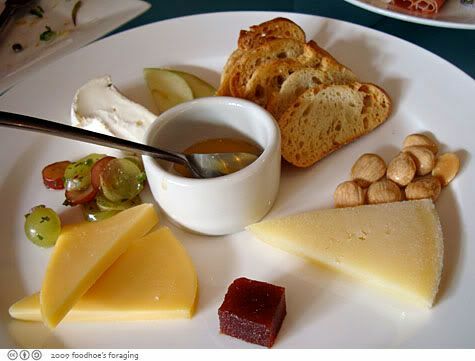 Cheese plate ($15 for a selection of 3) with goat brie (AOC soignon, france) sheeps milk abbaye de belloc and a dutch gouda. It was served with honey, toasted bread, marcona almonds, a spicy relish of grapes with jalapeno and a square of quince paste. 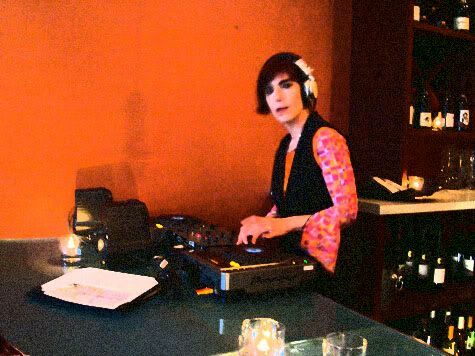 As the evening wore on, the room darkened and a woman setup a small sound system and proceeded to play a swirling ambient mix. 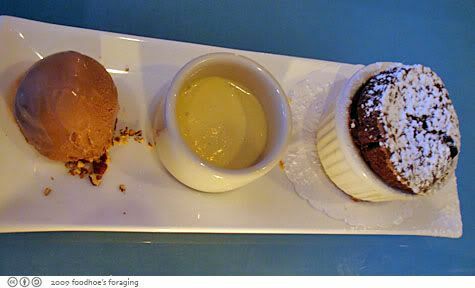 We finally worked our way through to dessert and split the Chocolate duo of a spiced souffle with creme anglaise and double chocolate ice-cream. The souffle was perfectly fluffy and so good with the sauce poured over it. Apparently the ice creams are also made in house. We licked the plates clean. 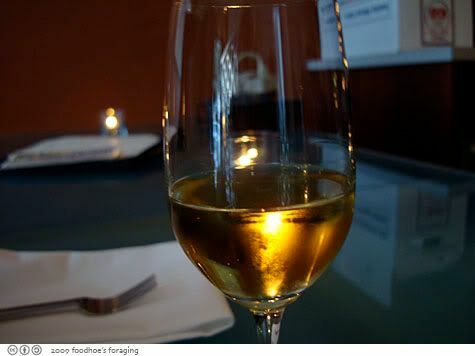 JT wisely chose to go with a glass of sauterne to pair with her dessert. 2005 Château Grillon, described as orange honey drizzled peach pie with fresh sweet cream and a eucalyptus chiffonade $6.5 a taste ($13 for a glass). I was still working on my last glass of white wine, which I found didn’t go very well with the chocolate. Next time, I’ll take their advice and have whatever they tell you goes with the dessert! 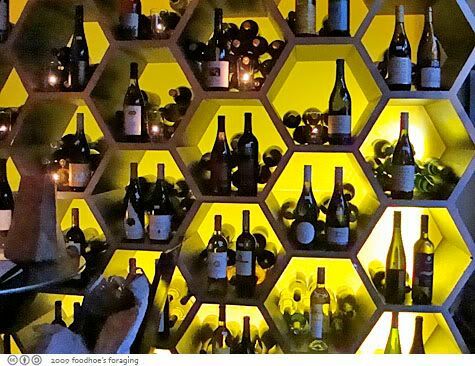 As you walk out, your eye is drawn to the cool glowing honeycomb-shaped wine display case, which showcases just a sampling of the 800 selection bottle list. hooray for gift certificates indeed! and i have to say, it’s so strange to me to see popcorn served up like that. strange and amazing. .-= grace´s last blog ..my buddy, my buddy =-. I remember going to Nectar a couple of years ago and really liking the place. The owner came and suggested wine and cheese pairing for us, which was really nice. I had no idea they served such great food though! .-= Cookie´s last blog ..More Freezer Meals =-. That truffle popcorn is soooo Michael Mina! They serve that at the Clock Bar. Looks like a fun happy hour place. .-= The Single Guy´s last blog ..What I Do For a Good Bowl of Ramen =-. Great review and awesome photos! I too am anti-Marina but occasionally find a good place there. 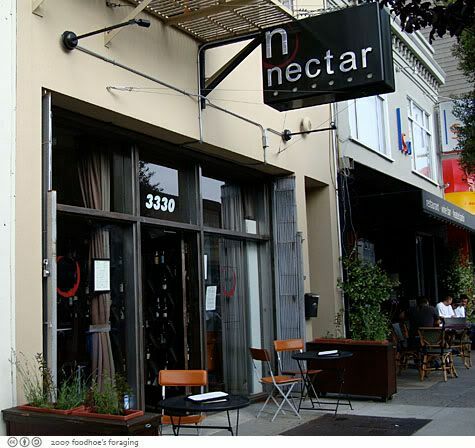 I actually went to Nectar in Burlingame last December and wasn’t very impreseed, but maybe the SF outpost is better. .-= hungry dodg´s last blog ..Chop chae for the cowboy round-up =-. I wonder how Mina feels about alums stealing his popcorn recipe? I’d be plenty upset 😉 A killer happy hour, Foodhoe. 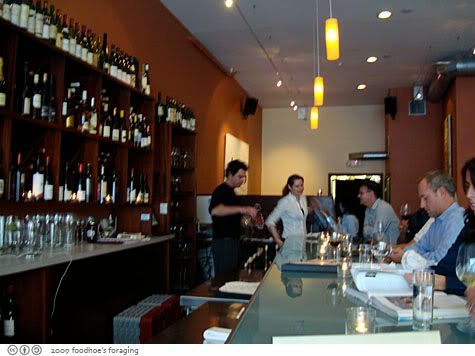 .-= Gastronomer´s last blog ..Cham Korean Bistro – Pasadena =-. grace, if you ever see popcorn on the menu like that, order it! What a feast for happy hour, I like the anything but chardonnay flight. I have too many people who never stray from chard. 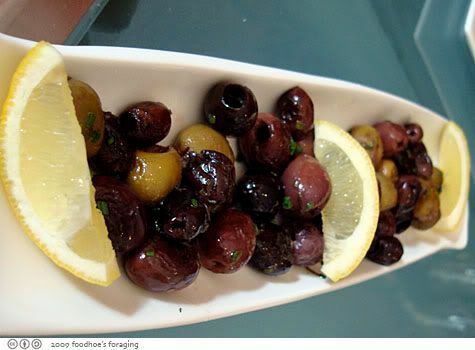 .-= cocochanelella´s last blog ..Stopped at a busy freeway hub for Dohatsuten’s Japanese Fusion Tapas =-. Now that’s a “happy” Happy Hour! .-= Kirk´s last blog ..Nazca Grill =-.